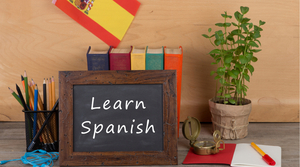 Learn Spanish at your own pace, with no classroom pressure! You don’t have time to attend Spanish classes. You cannot find a good private Spanish tutor. You prefer to learn on your own, at your own pace. You are a complete beginner and you don’t know how to start learning Spanish. You feel overwhelmed with the amount of resources available and you don’t know which are good/bad. 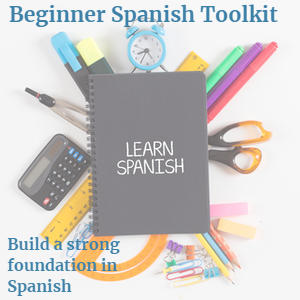 You have been learning Spanish for a while but feel your learning has hit a plateau and you need new ideas and new Spanish-learning resources. You are losing motivation and need more direction. This course teaches all levels of Spanish learners how they CAN learn Spanish on their own without going to a class or private tutor. It focuses on the core parts of language learning: growing vocabulary, improving listening, speaking/pronunciation, reading, writing, grammar and how to set up a successful language exchange. It teaches you not only WHICH ARE the most effective resources to use, but HOW to use them to get maximum benefit to improve your Spanish. 24 short video lectures with accompanying pdf transcripts. 10 Workbooks for you to make notes and log your progress. Essential Spanish Phrases for your Language Exchange. 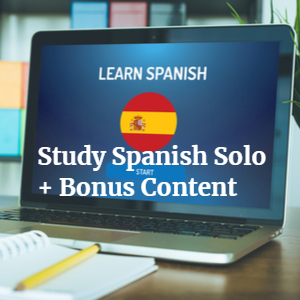 There is hardly anything else like this available – a self-paced course that teaches you how to learn Spanish on your own. 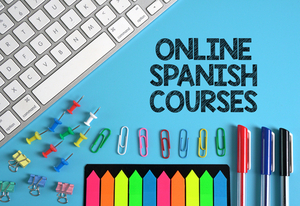 This course is a MUST-HAVE for anyone who wants to kick start their Spanish and learn how to study it on their own. The lectures provide you with all the information and resources you need to learn to speak Spanish well and to feel motivated with more focus and direction. You could spend hours researching on the internet which are the best course books, CDs, apps and grammar resources to use. You could try out some that turn out to be not that useful to you at all and waste precious study time but with this course you have everything you need at your fingertips plus instructions as to how to learn to speak Spanish successfully. This mini course teaches beginners the essentials of the language to get you speaking and understanding Spanish as soon as possible. Just by learning these words you will be able to get by in basic Spanish in every day situations. Just by learning these key verbs you will be able to express your needs and wishes and ask questions in Spanish straight away. The Spanish language involves a lot of slang expressions that you hear all the time. If you can pick up the most common ones, they can really help you join in with the locals and help you sound more Spanish. These expressions may not be found in a dictionary or text book, so this is an ideal opportunity to learn some REAL Spanish! 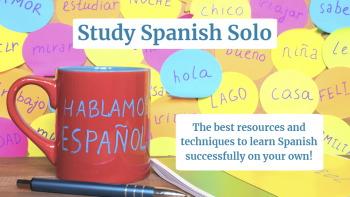 You could combine the main “Study Spanish Solo” course and the “Beginner Spanish Toolkit” above and download them as a bonus bundle which is better value. 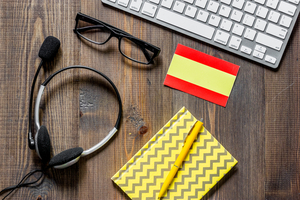 This course will equip you with everything a beginner Spanish learner needs to get started with learning the language in the right way allowing you to get speaking Spanish in record time. The courses aim to help you build a firm foundation in Spanish which means you will progress to higher levels more quickly and easily. "I have used the "Study Spanish Solo" course for a few months and it is a fantastic resource. If I am struggling to learn something I look for what will help me in the list of lectures. I then read and listen to the advice being given and rethink how I can help myself to master the problem. I use flashcards a lot, I have a language exchange partner and I do lots of practice. The information in the videos is very clear, helpful and motivating. Personally I think this is a resource that anyone could use from beginner to advanced." "The videos cover the topic very well for beginners, especially the series on power verbs. There are plenty of good examples with appropriate exercises to follow. This course features easy to understand lessons for those studying on-line or even in a small class group." Great value - download once, use forever!